To report a kindred with an association between hereditary primary lateral sclerosis (PLS) and progressive nonfluent aphasia. Six members from a kindred with 15 affected individuals spanning three generations, suffered from spasticity without muscle atrophy or fasciculation, starting in the lower limbs and spreading to the upper limbs and bulbar musculature, followed by effortful speech, nonfluent language and dementia, in 5 deceased members. Disease onset was during the sixth decade of life, or later. Cerebellar ataxia was the inaugural manifestation in two patients, and parkinsonism, in another. Neuropathological examination in two patients demonstrated degeneration of lateral corticospinal tracts in the spinal cord, without loss of spinal, brainstem, or cerebral motor neurons. Greater loss of corticospinal fibers at sacral and lumbar, rather than at cervical or medullary levels was demonstrated, supporting a central axonal dying-back pathogenic mechanism. Marked reduction of myelin and nerve fibers in the frontal lobes was also present. Argyrophilic grain disease and primary age-related tauopathy were found in one case each, and considered incidental findings. Genetic testing, including exome sequencing aimed at PLS, ataxia, hereditary spastic paraplegia, and frontotemporal lobe dementia, triplet-repeated primed polymerase chain reaction aimed at dominant spinocerebellar ataxias, and massive sequencing of the human genome, yielded negative results. 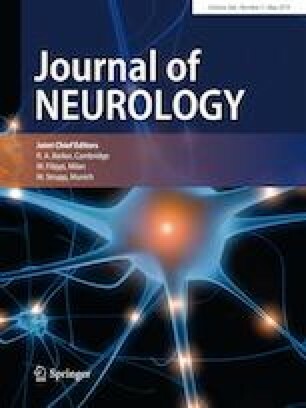 A central distal axonopathy affecting the corticospinal tract, exerted a pathogenic role in the dominantly inherited PLS-progressive nonfluent aphasia association, described herein. Further molecular studies are needed to identify the causative mutation in this disease. The online version of this article ( https://doi.org/10.1007/s00415-019-09235-x) contains supplementary material, which is available to authorized users. Our thanks to Dr. Antonio Oliveros-Juste for remission of patients; Drs. Ana Vela and Jordi Aldomá for MR images; Mr. Juan Ramón Solans, Drs. Ariadna Fernández-Sanz and Jesús Aladrén-Sangrós for help with the videtapes; Mrs. María Jesús Chopo for obtention of DNA samples; Mrs. Teresa Sopeña Biarge and Mrs. Mar González-Cantalejo from the Medical Library of Hospital Universitario Miguel Servet, for bibliographical research; and Dr. Jorge Alfaro for assistance in the pathological studies. All human studies have been approved by the appropriate ethics committee and have therefore been performed in accordance with the ethical standards laid down in the 1964 Declaration of Helsinki.